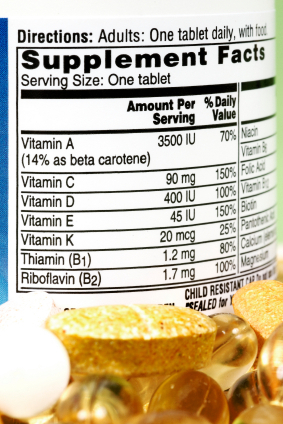 Nutritional Supplements: Are the Benefits Worth the Cost? 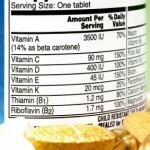 Home / 2011 / May / 10 / Nutritional Supplements: Are the Benefits Worth the Cost? Everyday millions of people are bombarded with radio commercials, TV infomercials, internet ads, and aggressive sales pitches touting the health benefits (many of them unproven) of nutritional supplements. Warnings about potential adverse reactions, toxicity, food/drug interactions, and other precautions are often under-emphasized or absent. It is important to note that dietary supplements are not regulated by the FDA and as a result manufacturers do not need to prove safety or effectiveness. In April 2011, the CDC National Center for Health Statistics issued a report based on a survey studying patterns of dietary supplement use in adults over time. A key finding was that over one-half of the U.S. adult population used dietary supplements in 2003-2006. So, if you’re 20 years of age or older and reading this, odds are greater than 2:1 that you’re taking an over-the-counter dietary supplement. Here’s an example of how one man’s use of Colloidal Silver gave him the blues, literally. We have compiled a brief list of nutrients and supplements with their associated symptoms from regular use, misuse, or overdose. Please note: this is by no means is a complete list. If you have specific questions, please call the Illinois Poison Center at 1-800-222-1222 (24/7/365). Vitamin A: Large doses may cause nausea, vomiting, abdominal pain, loss of appetite, fatigue, irritability, bone pain, hair loss, increased pressure on the brain, blood coagulation changes, liver damage, and increased blood calcium. Vitamin D: Large doses may cause weight loss, nausea, vomiting, kidney damage, and irregular heart rhythm associated with high blood calcium levels. Vitamin C: Chronic large doses have been possibly implicated in kidney stone formation. Vitamin E: Large doses have been associated with headache, fatigue, GI upset, and increased bleeding tendencies. Vitamin K: Large swings in Vitamin K intake may make regulation of therapy with prescription blood thinners (warfarin) more difficult. Niacin (Vitamin B3): Transient side effects with therapeutic/regular doses include flushing, itching, GI upset, and a rise in blood sugar. Chronic large doses, as in treatment of high cholesterol, may damage the liver. Pyridoxine (Vitamin B6): Chronic extra-large doses may cause nerve damage with symptoms of numbness, tingling, pain, clumsiness, and loss of coordination. Magnesium: Large doses, especially in patients with reduced kidney function, can cause flushing, nausea, vomiting, low blood pressure, and irregular heart rhythms. In serious cases, impaired consciousness and difficulty breathing may occur. Potassium: Large doses, especially in patients with impaired kidney function, can cause vomiting, diarrhea, weakness, numbness, and muscle cramps. In serious cases, low blood pressure and life-threatening irregular heart rhythms may occur. Chromium: Therapeutic/regular doses may cause stomach upset. Large doses can lead to kidney or liver damage, and irregular blood cell counts. Kava Kava: Chronic use may cause kidney or liver damage, weight loss, shortness of breath, blood cell count changes, and rash. Guarana, Green Tea, Kola Nut, Theobroma (Natural Caffeine Sources): Large doses may cause irregular heart rhythms, chest palpitations, increased heart rate, and nervous system stimulation. St. John’s Wort: Many drug-drug interactions may occur with this supplement. For example, use with prescription antidepressants may cause serotonin syndrome with symptoms of high blood pressure, elevated heart rate, anxiousness, and sweatiness. Chronic therapeutic/regular use may cause stomach upset, fatigue, confusion, and tiredness. Ginseng: Chronic use may cause vaginal bleeding, breast pain, mental status changes, and severe rash. A ginseng abuse syndrome has been reported following long-term use and includes the development of high blood pressure, nervousness, insomnia, and morning diarrhea. Ginko: Chronic use can prolong bleeding time as well as cause stomach upset, nausea, chest palpitations, allergic skin reactions, and may lower the seizure threshold. Considering some of the serious symptoms that are associated with using some of these supplements, do you feel that the benefits still outweigh the cost? Or are you more inclined to monitor and moderate the use of your supplement intake to avoid such symptoms? Please share. Remember, if you or a family member suspects a problem from the use of one of these products or has a general question, please call the Illinois Poison Center at 1-800-222-1222 to consult with one of our experts.